Salmon fish cakes are another family meal that can be made from store cupboard ingredients and a few vegetables that are in your vegetable rack. Canned fish is very tasty and a lot cheaper to purchase and quicker to use than the fresh variety. With so many of us not having access to a local fishmonger canned fish is the next best alternative and a good way to enjoy one of the recommended portions of fish that we should eat each week. Peel the potatoes and cut into equal sized pieces. Boil in salted water until tender and drain. Using one third of the butter mash the potatoes thoroughly. Open the can of pink salmon and drain remembering to remove any small visible bones. Flake the pink salmon into to mashed potato. Remove the outer parts of the spring onion and using scissors snip the remaining onion into the potato and salmon mix along with the chopped parsley and tomato ketchup. Beat the egg and add to the mix stirring so that all the components are thoroughly blended together. Season to taste. Divide the mix into four portions or six if you wish to have smaller fish cakes. Sprinkle a little flour onto a flat surface and using your hands mould each fish cake into a round pattie shape. Heat the remaining butter in a pan and fry the fish cakes on both sides until each one is golden brown. Do not over heat the butter or it will burn and give off a bitter taste. Coat each fish cake in beaten egg and dip into breadcrumb to cover all over. Fry as before until the breadcrumbs are nice and brown. For a courser coating add a handful of porridge oats to the breadcrumbs and for a crunchier coating smash some cornflakes and mix with breadcrumb to coat the fish cakes. You can make your own breadcrumbs by placing a few slices of slightly stale bread into your blender and blitzing it until it is fine. Alternatively you can grate the bread by hand. If you would like a spicier fish cake add a half teaspoon of ground ginger, a pinch of paprika pepper and a chopped clove of garlic into the mix before forming the fish cakes. 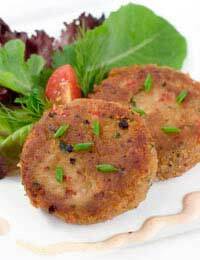 Curried fish cakes are made by adding two teaspoons of curry paste to the mixture. For a more colourful fish cake try adding chopped peppers or even grated carrots. This is a popular way to give your children their five portions of vegetables each day by hiding them inside a fish cake! Canned tuna, pilchards, sardines and even red salmon can be substituted for the pink salmon in this recipe but try not to use fish canned in oil as it will spoil the taste of the finished fish cake. When cooked serve immediately with a green salad. This recipe is great! quick and easy to use and always a pleaser.